3B Umpire Mike Everitt ejected Braves Interim Manager Brian Snitker for arguing an out/home plate collision no-call by HP Umpire Jordan Baker and affirmed by Replay Review in the bottom of the 7th inning of the Mets-Braves game. With one out and two on (R2, R3), Braves batter Ender Inciarte hit a 0-1 slider from Mets pitcher Sean Gilmartin in the air to left fielder Michael Conforto, who caught the fly ball and threw to catcher Travis d'Arnaud as Braves baserunner R3 Emilio Bonifacio slid into home plate. Initially ruled out, Baker's ruling was confirmed upon a Manager's Challenge by Snitker, and his home plate violation no-call stood upon Crew Chief review. Replays indicate d'Arnaud tagged Bonifacio prior to Bonifacio's foot contacting home plate, and that d'Arnaud did not illegally block home plate prior to receiving the throw, the call was correct. At the time of the ejection, the Mets were leading, 3-2. The Braves ultimately won the contest, 4-3. This is Mike Everitt (57)'s first ejection of the 2016 MLB regular season. Mike Everitt now has 4 points in the UEFL Standings (1 Previous + 2 MLB + 1 Correct-Crewmate = 4). Crew Chief Mike Everitt now has 3 points in Crew Division (2 Previous + 1 Correct Call = 3). This is the 79th ejection report of the 2016 regular season. This is the 30th Manager ejection of 2016. 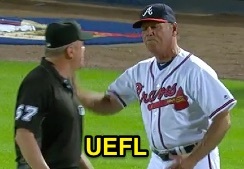 This is Atlanta's 3rd ejection of 2016, T-2nd in the NL East (NYM 4; ATL, MIA, WAS 3; PHI 0). This is Brian Snitker's first career MLB ejection. This is Mike Everitt's first ejection since May 13, 2015 (Terry Francona; QOC = U [Warnings]). Wrap: New York Mets vs. Atlanta Braves, 6/23/16 | Video available via "Read more"